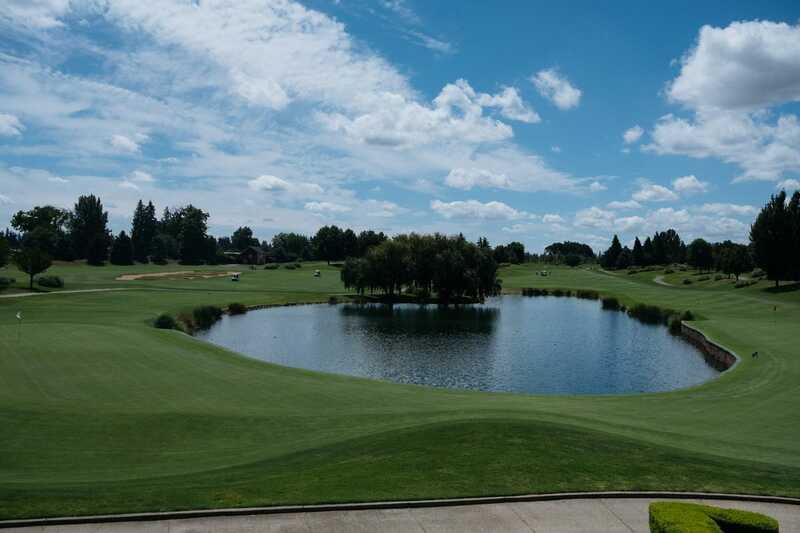 Nestled not too far off of the I-5 Highway just 15 miles south of Portland in Aurora, Oregon is Langdon Farms Golf Club, a serene wedding venue that’s tucked away from the hustle and bustle of the city. 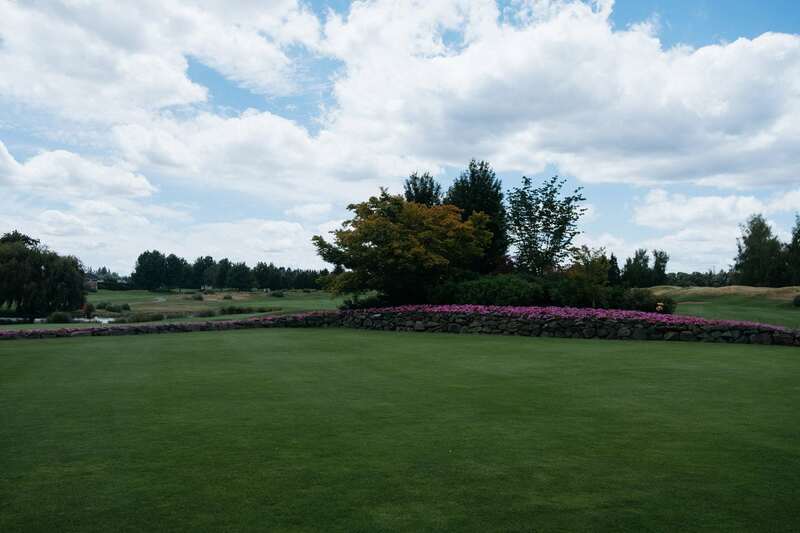 The folks here host about 80 weddings a year, in addition to over 100 golf events. Surrounded by the iconic Pacific North West beauty, this venue is the ideal spot for the couple seeking a country wedding, with all the amenities within reach. The team at Langdon Farms Golf Club are passionate about making the planning process of your wedding day go smoothly, with wedding packages that offer full ceremony and reception set-up and breakdown, complimentary on-site ceremony assistant and reception coordination, and one-hour rehearsal time with the ceremony assistant, among many more offerings. As the exclusive on-site caterer, they offer a variety of easily-customizable menus that work for whatever you have in mind. Event staff are there to service the dinner, and bartenders are available as well. The on-site wedding coordinators make sure your preferred vendors (photographer, DJ, florist, cake, etc.) know where to go when they arrive on the day-of, and make sure all the details for your big day are sorted ahead of time so everything flows flawlessly! Brides can get ready in the secluded Bridal Suite, with a full apartment layout that overlooks the vibrant green golf green and bright colorful flowers on the property. 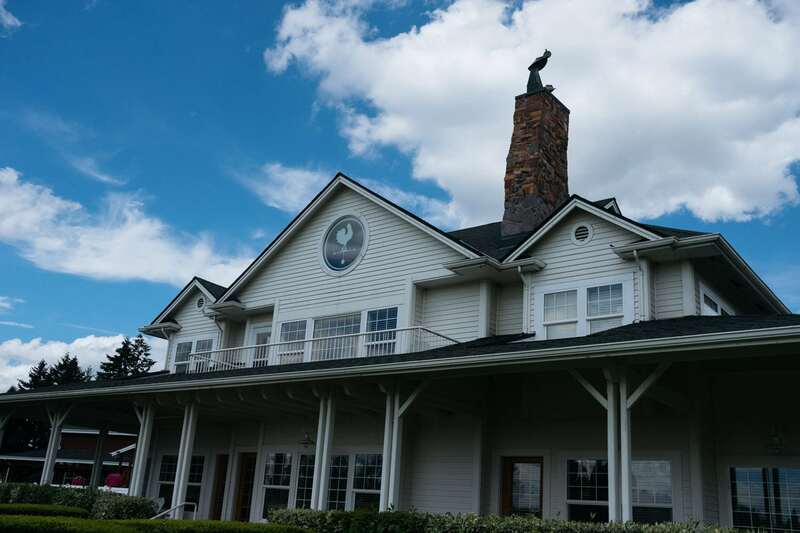 The Suite is located in “The White House” – which was originally built as a place for the architects to call home while the golf course was being created. 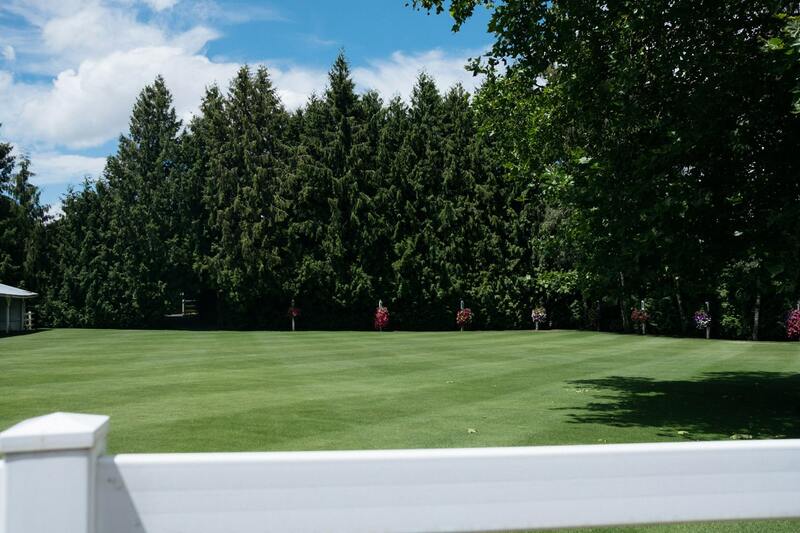 The Red Shed Lawn, which looks over the 18th green of the golf course, is the most popular spot for outdoor wedding ceremonies. The vast open space is surrounded by a coral bark maple, cherry and dogwood tree, in addition to vibrant flower beds that add a pop of color to your vow exchange backdrop. 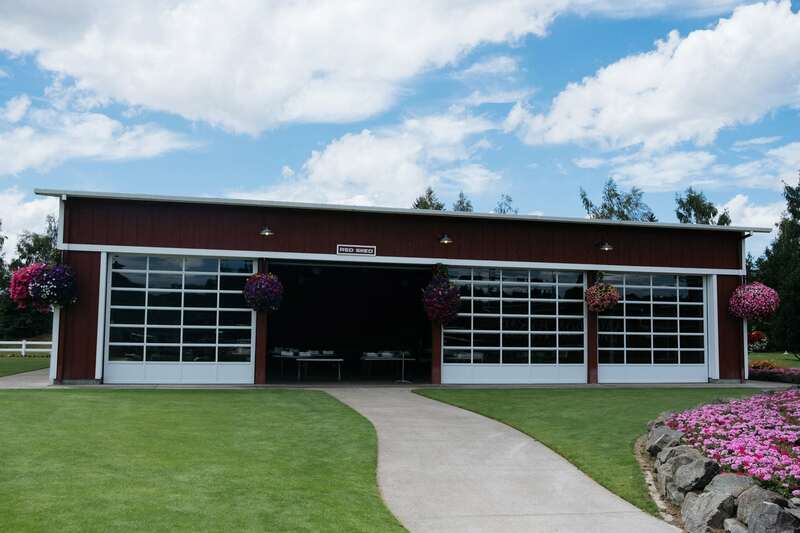 The Red Shed, just off the Red Shed Lawn, is perfect for a reception and can accommodate 300 guests inside, or even more people if you decide to utilize the surrounding lawn to seat guests outside the shed. The shed has a modern yet rustic look to it, and was designed with an open-air design and several “garage door” style walls with plenty of windows – so you can open them up to enjoy the fresh air of Langdon Farms Golf Club, or opt to open one for some soft breeze. String lights hanging on the wooden ceiling beams add a fun lighting option as your guests dine and dance the night away on the checkered dance floor. The Orchards is another gorgeous option for your ceremony site, where you and your guests will be surrounded by lush trees and the aroma of the various flowers hanging in baskets. The simple backdrop can be dressed up with décor or kept as is for an elegant outdoor “I do”. Thanks to the trees, there is plenty of shade for your guests to hide under on a hot summer day. 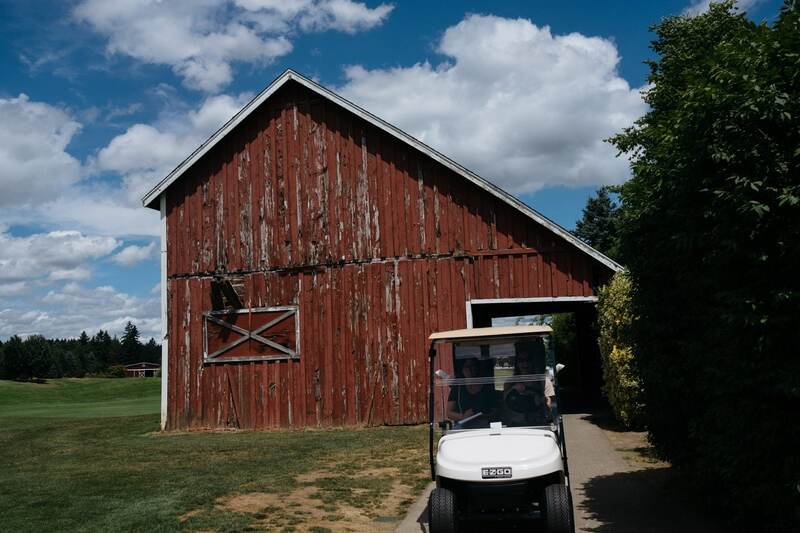 The Orchards is a little farther tucked back from the course, and sits next to a rustic white barn. Golf carts are provided for the Bride, Groom, and Photographer to use on your big day for ease of travel. 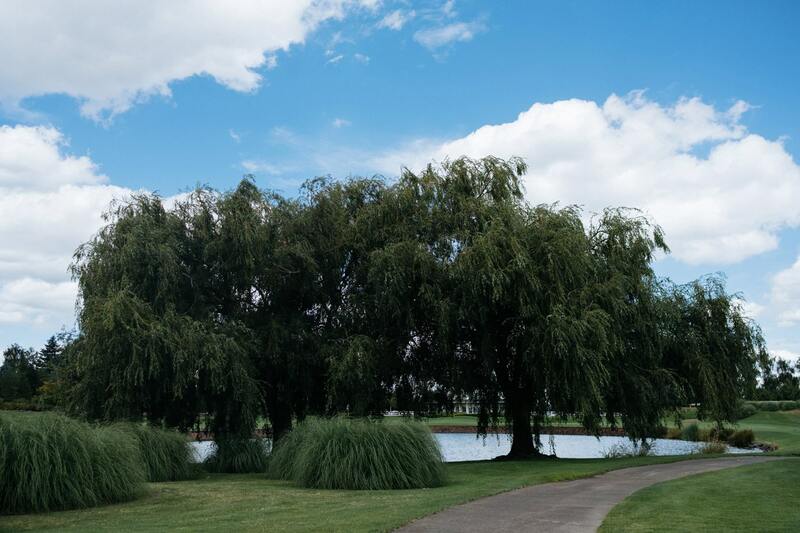 Large willow trees along the golf course make for a stunning photo-op, in addition to the Little Red Barn that the couple is able to take photos near. Spots for great family photos include The Orchards, The White House and The Red Shed Lawn. It is the ideal location for your wedding if you’re seeking a country, outdoorsy feel with the support and service of a team that wants you and your guests to enjoy the relaxing atmosphere and make some memories you’ll never forget! 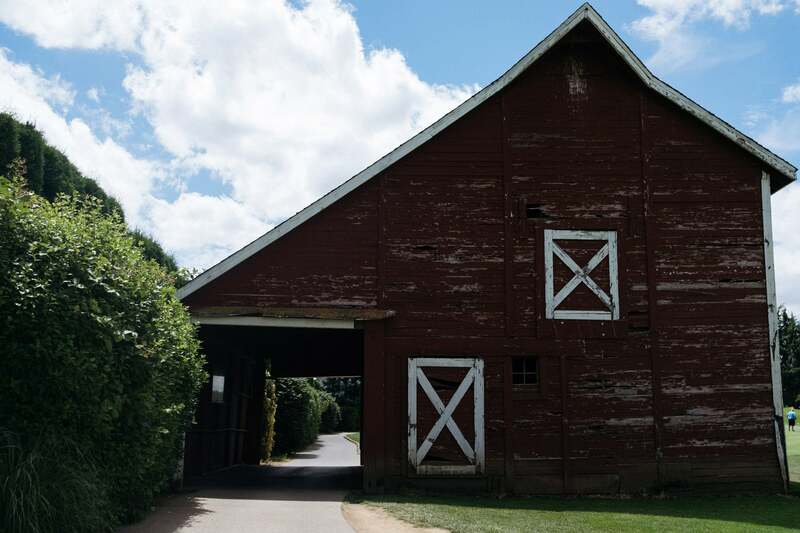 Stellar place to host a hassle-free outdoorsy or barn wedding, not too far from downtown Portland, surrounded by emerald greenery and full of charm.